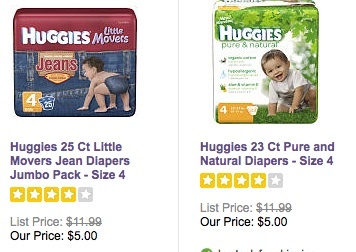 There is a crazy deal on diapers today and tomorrow only (7/24-7/25) at Babies R Us. Get any Fisher-Price, Babies R Us brand, Seventh Generation, Earth’s Best, Huggies Pure & Natural or Huggies Jean Diaper jumbo packs for $5. Guess what, you can still use coupons!! The deal gets even better if you want Huggies Pure & Natural: buy 2 packs and get a $5 gift card (details here)!! If you don’t want to deal with the store or coupons, the deal is also available online. Make it a better deal by signing up for a free trial of Shoprunner to get free 2-day shipping on any order size!! Makes it $1 per pack! !